How Ike overcame chronic pain to become one of the game's most creative deck builders and popular pros. Mark "Ike" Eichner tells me he averages about one surgery a year. The 20-year old doesn't say this with any sense of drama. Instead, he speaks in the matter-of-fact manner of someone who’s been dealing with serious illness for as long as he can remember. At four weeks old, he was diagnosed with congenital pseudarthrosis of the tibia and fibula, or as he describes it, "an extremely rare bone disease that's hard to spell and nobody knows." In layman's terms, the condition means that his legs are bowed, which leads to fractures that fail to heal on their own. Nobody knows what causes it, and even after repairment surgeries, the bone can soon fracture again. So at the age of 19, Ike is already used to working with a baseline of chronic pain, he's used to not being able to walk for weeks and months at a time, he's used to frequent doctor appointments and consultancies. Most of all, he's used to being laid up in a hospital bed, playing marathon Hearthstone sessions. "Hearthstone filled this role socially," he tells me. "I'm able to talk to people online and have interaction, when it's really hard for me to do so now, and generally. There's a lot of time when I'm not really able to hang out with people in person, and the community fulfills that gap. I can play the game anywhere, no matter what is going on. Like I played League of Legends for five years, non-stop. But when you're actually in a hospital there's no way you could play League." Ike adds that after his most recent surgery, he spent eight days in the hospital, during which he jammed an Evolve Shudderwock Shaman deck almost the entire time on iPad. "I was able to put on a headset, and do whatever I needed to do." That deck was his own creation—a more tempo-oriented version of the usually more combo-oriented Shudderwock archetype, and the latest product of what Ike likes to call his lab. It carried him to the ranks of high legend that month, further cementing his reputation as one of the most creative deck innovators around. At the end of February, Ike will be representing Team Omni in the Hearthstone Winter Championship at the Blizzard Arena in southern California. If he makes the semi-finals, he'll be guaranteed a spot at the World Championship in Taiwan in April, as well as a cut of a $250,000 prize pool. It is difficult to think of anyone else in esports who's made it this far under comparable conditions. As Ike noted, you can't reach the top of Counter-Strike, or Dota, or Rainbow Six in between frequent hospital bookings. Hearthstone though? Hearthstone is perfect—the game's pace gives it a unique flexibility that enables it to find superstars anywhere. The only real issue to being in the esports scene, says Ike, are the plane trips. Those cramped conditions give him some pain. That being said, if he makes it to Worlds, nothing will hold him back. "There shouldn't be anything that would be like an emergency," he says. "It would just be tough." "[Once,] after crutching around, and getting up for the first time, I went into the bathroom with my iPad. I was rank 2 Legend and trying to get rank 1. I was in that huge robe thing, on a toilet with handle bars I was holding onto, dragging fireballs at the opponent's face with my finger," says Ike, when I ask him if he has any particularly memorable moments from his hospital grinds. "I didn't get Rank 1." The way Ike describes it, he's always been a competitive gamer. Back in his League of Legends days, he hit the lofty Challenger tier, which often serves as a gateway to the game's fertile esports scene. He never made that transition, though. In his words, he was just "too young" to leave middle school behind in order to travel the world with an upstart pro team. Still, it was startling to hear that he's managed to excel at both a MOBA and a card game—two genres without any specific mechanical similarities. (The only other person that comes to mind is Andrew "Tidesoftime" Biessener, who played Dota professionally before moving to Hearthstone.) Is it possible to have a natural Bo Jackson-like gene for video games? "The only thing that transfers to Hearthstone from my League skill set was my ability to communicate. I was definitely the shot-caller on my League of Legends team. I was the guy coordinating everything. That was the biggest asset I bring to the table," he explains. "So, in Hearthstone, I'm someone that people of all different styles connect with, and I think I can help people in different situations by breaking things down. Mechanically I wouldn't say I'm incredibly good, but I think I have different abilities that are at a higher level, like deckbuilding, lineup building, communication. Those are my gaming skills that transfer over to all kinds of games. Like I played CS:GO and I'm a lot worse at that. But I was still able to get top ranked by finding people that are good at shooting and telling them what to do." Ike's affability has enshrined him as one of the rising stars in the Hearthstone streaming community. His Twitch broadcasts are fizzy and fun, emphasizing his natural wry humor and straightforward insights. "Just hit him in the face" is a common refrain that has become close to his catchphrase. Hearthstone can be an easy game if you let it. Ike joked that he had channeled the power of Brode by wearing a similar flannel shirt during his charge through the recent Winter Playoffs. He still managed to qualify despite submitting slightly incorrect deck lists. "We have spent a lot of time gaming together and become close friends through it," says Zalae, when I reach out to him for this story. "Ike is brilliant. I've learned a lot from him. In particular some of the speech patterns the community associates with me, I learned from him. Speaking simply and saying what's important in a way that's so obvious it's funny: 'hit him I'm the face so he has less life.'" Still, most people around Hearthstone didn't know about Ike's medical history until he detailed the specifics of his condition in a lengthy Twitlonger this January. 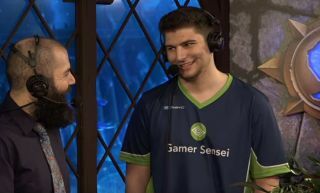 It came just after Ike and Matt "noblord" Koutsoutis piloted Ominslash to a first place finish in the HCT Americas Winter Playoffs, which represented Ike's greatest achievement in Hearthstone, and in esports, since winning Dreamhack Atlanta back in 2017. "I kinda just wanted to make a post about how Hearthstone has impacted me," he says. "I wanted to shout out the community, because they've done a lot for me honestly. I thought everyone should hear that side of the story." The Twitlonger's thesis is profound. "Having people to talk to without having to worry about how much pain walking around would cause, or worrying about if I can't do things that everyone else want to is a major reason I'm able to stay sane while not being able to walk for months at a time," he writes. "You guys are fucken awesome and I'm happy to call you guys my friends. So a special thank you to all of the people I talk to that I met in Hearthstone for being such an important part of my life." So good luck to Ike at the championship. We certainly hope he punches a ticket to Worlds. If he manages to scale that mountain, he'll be taking a bite of a life-changing $1 million prize pool. The esports scene is becoming increasingly omnipresent and inclusive. It can reach anywhere, even a hospital bathroom.